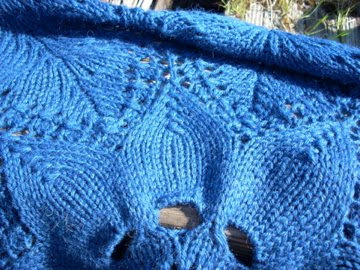 Knitting With a "Y": The Accounts of a Male Knitter: Better Lace Than Never! Yes, I know I need to quit with the awful titles, but sometimes I just can't help myself. For those of you who are still unable to guess the theme of this post, it's lace(!). Surprise! Here is the very belated Hemlock Ring Blanket, designed by Jared Flood (BrooklynTweed). 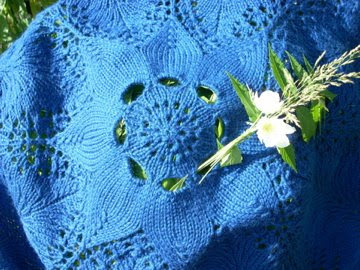 The pattern is adapted from an old doily pattern. Jared was somehow able to see a beautiful, very popular blanket pattern when he saw that old doily, and yet another successful pattern by the New Yorker was born. 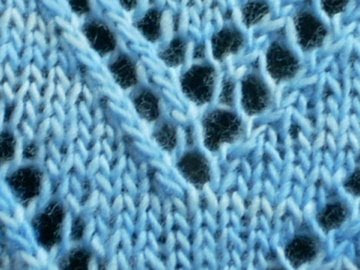 I knit mine using Knit Picks Wool of the Andes in Winter Night using size 10 needles (Knit Picks Harmony). I had bought ten balls of yarn to make this, but ended up using only 8, with two yards to spare. Yes, I could have continued, but I don't think I could have handled any more feather and fan business. The bind off alone almost threw me over the edge. I knit to the end of Jared's charted pattern (I think it's row 91 or something) and then did the bind off. I didn't measure how big it is, but I would guess that it is about 5 feet from point to point. This is fun having enough pictures to space out all my info... The yarn, WotA, actually surprised me at the beginning. It felt much softer than I thought it was going to and I liked the way it looked knit up on size 10 needles. However, after knitting an entire project using this yarn, I think my views have changed. It is scratchy (which is to be expected), but I at least thought it would soften up after a good soak in Eucalan - not so. Of course, at $2.00 a pop I got what I paid for. I'm just not sure if I would use it again. I ran into a few problems with my needles as well. At one point in my knitting, the wood needle tip came out of the metal base and I had to order new ones. Also, the plastic cable came out of the metal screw - you guessed it, I have to order new ones. Of course, when I say order, I mean I called up customer services and they were very nice and sent me new ones free of charge. Let me tell you, when you have no motivation to finish a project to begin with, and then your needles keep breaking, I am surprised that this blanket made it to the finish line, but here it is. It will now probably go into storage until a small wool lap blanket is actually necessary. Goodbye Mr. Hemlock, it was relatively fun. 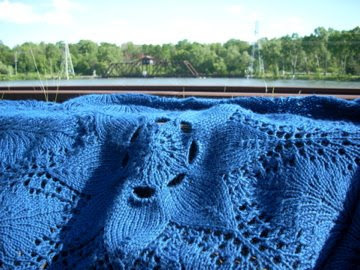 Down below you will see an unblocked picture of my Swan Lake Stole by Melanie Gibbons. 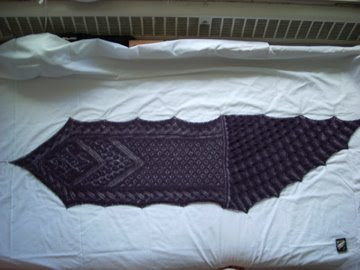 I will give you full details when it is all blocked and beautiful, I just wanted to post a picture to prove that I have actually completed the project after a year of knitting on it. 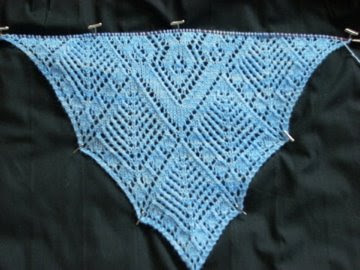 Hopefully my blocking wires will come tomorrow and I can beautify it and take wonderful pictures. The same day that I cast off on the Swan Lake Stole, I began knitting on this new piece of beauty. 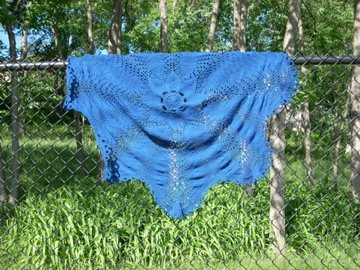 This is going to be the Mystic Waters shawl by Anna Dalvi. So far I would say that it is going much faster than the Swan Lake Stole went, most likely due to the fact that I now know what I'm doing (as in, I know what a yarn over is and I don't have to look up how to do a double decrease every time I come across one) and this yarn is just pure wonderful. 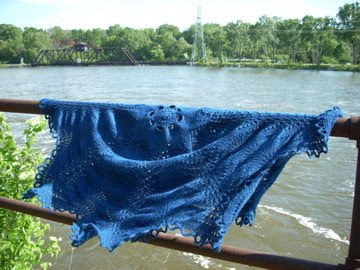 I bought two skeins of Malabrigo lace in Blue Surf. When I felt it in my LYS I couldn't resist and had to own it. This yarn has that strange soft in the way that when you touch it, it almost feels like you're touching nothing. The kind where you have to touch it very forcefully to make sure that it's actually there because you think you may have missed it the first time kind of soft. On the other hand, this yarn is very sticky to knit with. It's a good thing I never make mistakes (that's a lie), because I would hate to unknit this stuff. I went against my better judgement to alternate the two skeins every two rows so that the colors blend better. I have seen many a project knit in malabrigo in which there is a definite change in the color when a new skein is added, but alas, I am not alternating skeins. I tried, but the yarn is sticky and I didn't like the way the edge was turning out with the switching, and so when my join is as obvious as all the others, I will sit back and say, "I told you so." 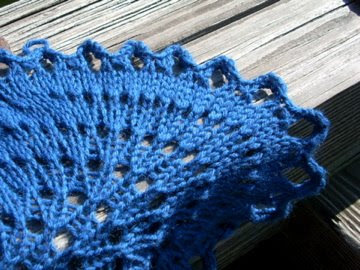 Until then, I will continue knitting happily along on this wonderfully soft shawl. Glad you like the Malabrigo though...it looks really good! You could try rinsing the scratchy blanket in conditioning shampoo. Some people say that works. 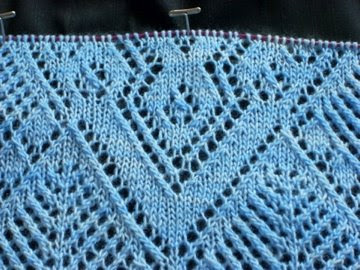 I have another stole elsewhere on my blog, by Sivia Harding. Check out her designs too. Great to see a young knitter with such talent.